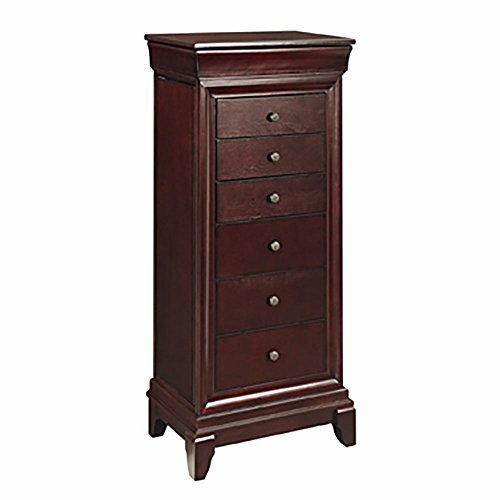 Powell 6 Drawer Free Standing Contemporary Cherry Jewelry Box Storage Armoire by Powell at The Black Pearl. MPN: 154-040J. Hurry! Limited time offer. Offer valid only while supplies last. Start accessorizing with the Powell Cherry Jewelry Armoire. Simple, clean-lined, and stately, it’s as elegant as any piece you’ll store inside. Start accessorizing with the Powell Cherry Jewelry Armoire. Simple, clean-lined, and stately, it’s as elegant as any piece you’ll store inside. Crafted with a durable engineered blend of MDF, poplar, and birch and paper veneers, this armoire boasts eight spacious drawers, each fully felt-lined, outfitted with organizational compartments, and fronted by round metal knobs. On either side of the armoire, touch-latch doors open to plentiful necklace hooks that keep your pearls and pendants from getting tangled or knotted. The flip top opens to a divided compartment and a convenient inset mirror. Based in Culver City, Calif., the Powell company designs, imports, and distributes occasional, dining, accent, and youth furniture across all style categories. Since 1968, Powell has grown to become one of the most recognized names in the home furniture industry. From sturdy, safe childrens furniture to elegant bedroom and other home collections, Powell continues to develop new and exciting designs for homes around the globe. Dimensions: 18W x 11.75D x 42.5H in.. Engineered wood in rich cherry finish. 8 fully lined drawers and 2 lined side doors. Necklace hooks and numerous organizational compartments. Flip-top with inset mirror and compartment inside. Stately, clean-lined design. Dimensions: 18W x 11.75D x 42.5H in. If you have any questions about this product by Powell, contact us by completing and submitting the form below. If you are looking for a specif part number, please include it with your message.